I’m not talking about matrimony, here, but how well an audio or visual recording resembles the real-world phenomena it seeks to capture. High fidelity sounds and images used to be both a mark of professionalism and a barrier-to-entry for hobbyists in the temporal arts (film, video, music, etc.). I suppose the same discussion could have played out regarding the static arts a hundred and fifty years ago — and it probably did — but I’m not much of a painter, so I’ll stick to what I know. If I wanted to make a movie in 1995 with my camcorder (VHS! ), I could do it, but it would look and sound like hell. There would be an obvious and extreme fidelity difference between what I was able to do on my own and what somebody would pay money to go see in a theater. But now that’s gone. I can shoot a movie ON MY CELLPHONE that can play in a multiplex. I can (and have) record a song in my bedroom that will play on the radio. 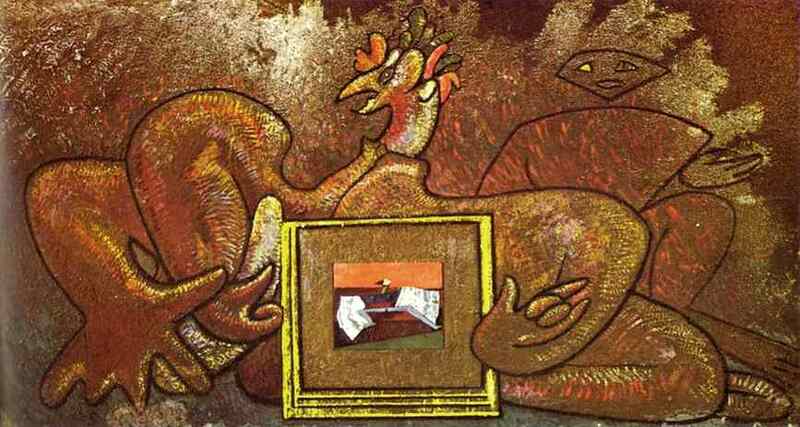 Loplop Presents Loplop by Max Ernst. Those are the facts, but my actual question is an emotional and experiential one. To use a food metaphor, has the sophistication of the listener/viewer changed to the point where we are now better able to taste the quality of the ingredients even if the presentation on the plate is lousy? Or have aesthetic decisions eroded our ability to even tell what’s good or bad about how something looks or sounds anymore? Serious question. What do you think? People call a lot of Elliott Smith’s and Iron & Wine’s recordings “lo-fi,” but how lo-fi are they, really? I mean, they were recorded on good equipment, you can certainly hear everything clearly, and they’ve got great dynamic range, so what else do you want? Sure, they’re not over-produced in the way that a Rhianna or Katy Perry song puts everything the producer can think of in a sonic pot, but they’re not actually low fidelity recordings. See, for me coming up on metal bands and hard-to-find import CDs from Scandanavia, I heard some stuff that was really, legitimately low fidelity (a lot of black metal comes to mind), where it’s honestly difficult to even make out what’s going on in the song. The Tincanland blog has done a couple of good posts that touch on this topic, asking the question of whether or not a self-produced album can succeed commercially (sure, why not? ), and how artists don’t get a second opportunity to impress someone if their stuff sounds like hell (unless they change their name). This is a very personal question for me, because when Black Spiral released Defeat way back in the long, long ago, most of the reviews we got were really positive, but the ones that weren’t got hung up on the production. Some writers utterly crucified us for it…but the thing is, the production’s not bad. It doesn’t sound like it was made on a major label budget, but pop in a Darkthrone album from the same period, which mostly sound like they were recorded on a cassette in somebody’s bathroom, and tell me we don’t win that battle. A couple of years later, I shot a no-budget DV feature, and not even small film festivals would take it seriously. OPEN WATER hadn’t hit yet, and for most people the idea of exhibiting a film shot on DV was laughable. But that doesn’t have anything to do with the content of the movie — which, again, reviewers really, really liked — just the presentation. For me, it remains an open question. Audio, video, and computer technology has come so, so far in the last ten years, that we shot our music video for “Broken World” on a camera that was in many ways superior to the f900s George Lucas used to shoot the first STAR WARS prequel. So people are able to make things that look better more quickly and more cost-effectively, and we may have gotten somewhat used to pixellation, compression, and a low signal-to-noise ration. But I guess if I was handing out advice, it would be to take the time, and put in the craft, to make things look and sound as good as humanly possible. Because I’m not convinced that we’ve trained ourselves yet to look past the presentation and at the content underneath. Or even that we’ve trained ourselves to understand there’s a difference. Good column – There's no right answer, but people do need to ask themselves these questions BEFORE they start a project. 100% agree. In our pre-production meeting on the new album, I told everybody that I wanted it to sound good and everything, but we were going to leave some rough edges, especially in performance. Given the theme of the album — man vs. machine — it was REALLY important that the music sound human. If you're aiming for CHR radio plays, though, you should probably make a different choice.